July 22, 2017. Schaslyve. Kniazha arena. 27 oC. The rivals came into the head-to-head clash, having three points following the first round. Valeriy Kryventsov has entrusted a place in goal to Oleh Kudryk, with Viacheslav Tankovskyi operating in the midfield, as Oleksandr Zubkov played in the role of the right winger. After serving a one-match ban, Danylo Ihnatenko returned to the starting XI as well. 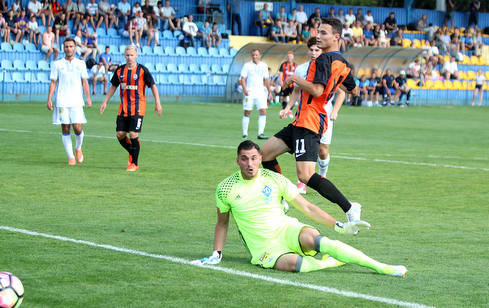 The Kyiv side mentor Yurii Moroz strengthened his squad with the fist team players for the second game in a row by fielding Sergii Rybalka and Artem Kravets. The opponents started a clash without probing. As early as inside the coming to the end opening minute, Zubkov raced into the area to fire a right-footed shot that was parried by Buschan. After that, Dynamo managed to gain the possession and launch several attacking moves, but the Miners produced a clever defensive performance. On 17 minutes, Kravets went one on one with Kudryk to scuff a chance wide. Shakhtar responded with an opportunity as Tankovskyi played a pass to Dmytro Topalov who kicked at close range, however, the visitors’ goalie made a save. In the second half of the opening period, after beating Ochygava in a striking style Hluschuk emerged clean through on goal at an acute angle only to find side-netting. In one of the following episodes, Yurii kept the ball for Zubkov, which hit into the defender, with Tankovskyi shot from the edge of the box forcing Buschan to deny the danger. At the break, the coaches did not make any substitutions. The Orange-and-Blacks produced an active performance in the opening minutes: Hluschuk nearly tapped Topalov low cross in, as Ihnatenko did not hit the target from about twenty meters. 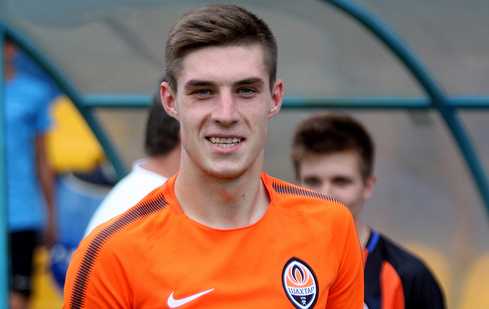 The white-and-blues saw Kravchenko’s belter that after deflection landed near the Donetsk side goal, with Kudryk clearing a long-distance kick by Kazakovin the 71st minute. Soon, Shakhtar took the lead. Following a first corner, defenders did not allow Sahutkin and Yalovenko to break the deadlock, but the following cross from the set piece resulted in a goal for the Miners: Ihnatenko sent his header home to make it 1-0. In the late stages, Dynamo hurled all efforts into the attack, but the Miners sat it out to lead the standings. 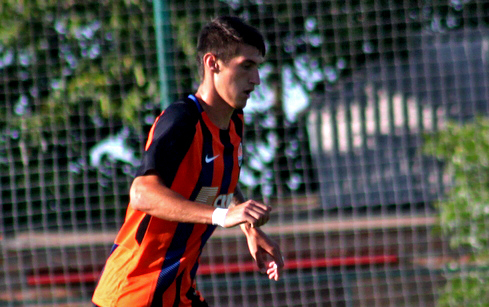 July 28, Valeriy Kryventsov’s lads will play Stal away. - This meeting was very important for us, because it is the Kyiv side, with which we will probably fight for the title again. It's good that we managed to come victorious and claim a three-point lead immediately. Therefore, we will be more comfortable. We geared up for the match carefully. We have been training within the whole week by doing muscle strengthening and speed exercises... Valeriy Sergiyovych put special emphasis on tactics. I think we managed to implement the coaching staff ideas on the pitch. The opponents had almost no efforts, as we created several opportunities, scored and won. In the scoring chance episode, I played according to the ball position: I usually go to the near post, but this time I calculated its flight path, jumped out and beat the defender to it. - The game was very crucial. Ahead of the encounter, we promised one another in the dressing room that we would fight to the end, whatever happens. That is what happened: each of us gave our all on the pitch, we were as one team and deservedly won. A corner brought a success to us that did not happen by accident. Valeriy Sergeyevich hoped for this and said that set pieces were our strong point and we had to make most of them. As for defensive performance, both the newcomer Yefym Konoplya and Sasha Masalov, as well as Valerii Bondar and myself proved ourselves not badly, in my opinion. Defenders’ coach Yevhen Kotov prepared us well, each of us worked well at the training sessions and demonstrate team chemistry and reliability, spot for each other. And since I'm the oldest in this line, I try to prompt everyone. It was interesting to test ourselves in the duel with Artem Kravets. This is the national team forward, who played in European competitions and has a lot of experience. I think we outperformed him and as well as other Dynamo players.